Mellow Bakers 70% Rye with a Rye Soaker and Whole Wheat Flour ~ I Can Do That! This bread from Jeffrey Hamelman'sBREAD is one of three (or four) for this month's MellowBakers. The other two are Bialys and French Bread. 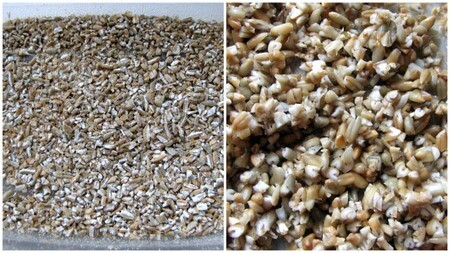 I was not too keen on sourdough rye maybe because I have never eaten an authentic rye bread. Most of the rye loaves I've had before were made with light rye flour and flavored with molasses and caraway seeds. I was also disappointed with The Bread Baker's Apprentice's sourdough rye bread which I considered one of the worst my least favorites. I was surprised how flavorful Mr. Hamelman's rye bread is. 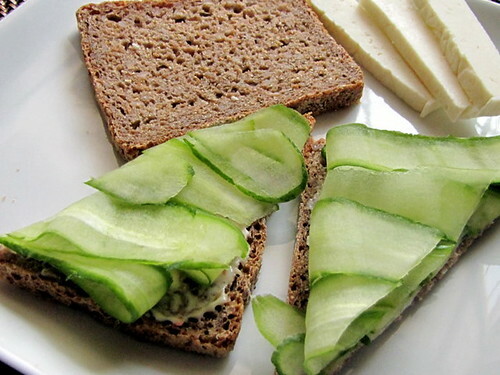 It is tangy, moist, dense, chewy, nutty, smells reeeaaally good, and perfect for my favorite cucumber open sandwiches. I can now honestly say I know what rye bread tastes like and that I love it. 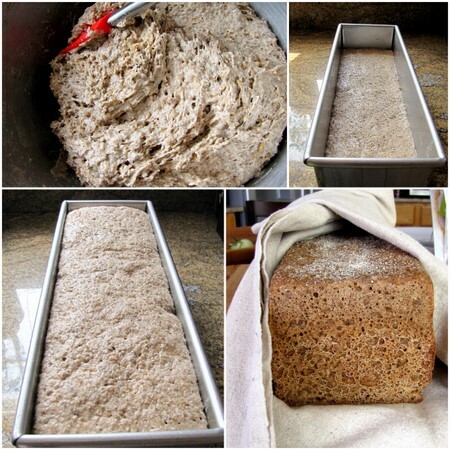 The sourdough bread recipe has medium rye flour, soaked rye chops, and a little whole wheat flour. I have some rye berries which I purchased when I was reading Daniel Leader's LOCAL BREADs but I never had a chance to use them. I "chopped" them using my burr coffee grinder which did an excellent job. I also soaked some in water and ended up chopping them by hand because they just swirled around in the food processor without getting chopped. The dough was very sticky and I don't know if it can be formed into a log as written. I just dumped the dough into the Pullman loaf pan sprinkled with rye flour. The aroma of the bread while baking made me want to slice it right away but the procedure says to wrap the loaf in baker's linen and leave for 24 hours. Your bread sounds and looks great! Especially for those cucumber sandwiches - my favorite! Good job. I am hoping to try this by this weekend. Have you really not made this before? Really? Wow! That is just perfect, and you did just the right thing dumping it in the pan and letting it rise. It is possible to loosely shape these doughs but to be honest it isn't really worth the effort. Oggi - looks lovely. I was thinking of skipping this as I'm like you, i"m not really into rye. Looking at your post makes me want to give it a try.